No Matter Where or What You Sell - Our System Works In Any City! Our 12 X 12 Marketing System Uses Demographics, Intelligence, Geography, Graphic Impact, Logic and Vital Information to Get Your BUSINESS Noticed By Thousands of LOCALS or Millions of Web Visitors! We Offer "Practical" Marketing TOOLS and Strategies to Promote Any Type of Business. Here's the breakdown. You have a business. You have a business location. You have a neighborhood where that business is located. You provide a service or product that's truly valuable to the right people. Great, now how do you find them? Or maybe the question should be, where? How will the customers you need ever find you? Welcome to Business Marketing 101. Fact: Most consumer purchases are made within 12 city blocks. Think about it! Most chains and franchises (Burger King, Starbucks, Target, Wal-Mart etc....there are now thousands!) can be found wherever there is enough market saturation. Most national chains, franchises, grocery outlets and even local banks have figured this equation out and are using it to reap HUGE sales by region count (census tracts). They know the 12-block rule and apply it vigorously in all of their sales and marketing strategies. They also know that market share is the most important term in the advertising game. Let's review a few things about the world of business advertising. There are more than 2 million new businesses started every year. (Most of these are homebased; this doesn't include MLMs or affiliate programs.) Over 500,000 of these will fail within 2 years. The average successful ad campaign costs about $250,000 dollars. The average TV commercial is $10,000 for 60 seconds. The average radio commercial is $100 for 60 seconds. ($5,000 to produce) To rent a cab-top billboard is about $300 a week. The average freeway billboard is between $2,500-$5,000 a month. All of these fall under the category of blanket advertising (expensive and mostly ineffective in the short run, especially for small businesses, but they work for chains and franchises simply because of the number and convenience of locations). Can you even hope to compete with their advertising budgets or reach? So now that you know how local buying habits directly affect you--how many of these people does your advertising strategy currently reach? Do you even know how many residents there are in the 12 blocks surrounding you? Let's expand our marketing radius to 2 or 3 miles or a single zip code. Do you know anything about those residents? More importantly, do they know about you? These are questions you will need to answer if you are making your business succeed locally or at all. The 12-block rule is the secret ingredient to franchise and chain store success. As a small entrepreneur, you will never beat them at this game unless you engage the customer on a more personal level. They are the big corporations, but you have one serious advantage. You don't need 300 customers a day to meet your bottom line. This gives you the upper hand in targeting your market. You might only need 20 a day or 20 a month to meet yours, and this means you can be a little more accurate in pinpointing your potential market. Smaller overhead means less mass-marketing is needed. Better to build than slowly and gradually and treat each customer as the precious commodity he or she is. You can spend less on "blanket type" advertising and be more direct in your marketing. This also requires some degree of "intelligence" on your part to determine who the best prospects are for your business. Start by determining who is a perfect candidate for what you sell. Is it something everybody can use--or is it something that everybody needs? There is a very big difference when it comes to marketing. Direct marketing is not just removing the middleman from the buyer-seller equation. It's also a more hands-on approach to reaching the consumer on his home turf. This means you'll need a deeper understanding of your customers and why they buy from you. Examine your business sales to date--who's been buying from you and why? Determine as much as you can about your current client or customer and you will have the basic profile of who your next one will be. Where in your own neighborhood do they live? Is there an overall demographic similarity between most of them and can you reach more of the same kind of individuals somehow? This is called "clustering," and this is the kind of market research information you'll need to create a plan for your own business marketing. Outdoor Media Reaches 96% Percent of US Consumers. Some 150 Million Americans Commute Every Business Day. The Average American Travels 15,000 Milers Per Year. 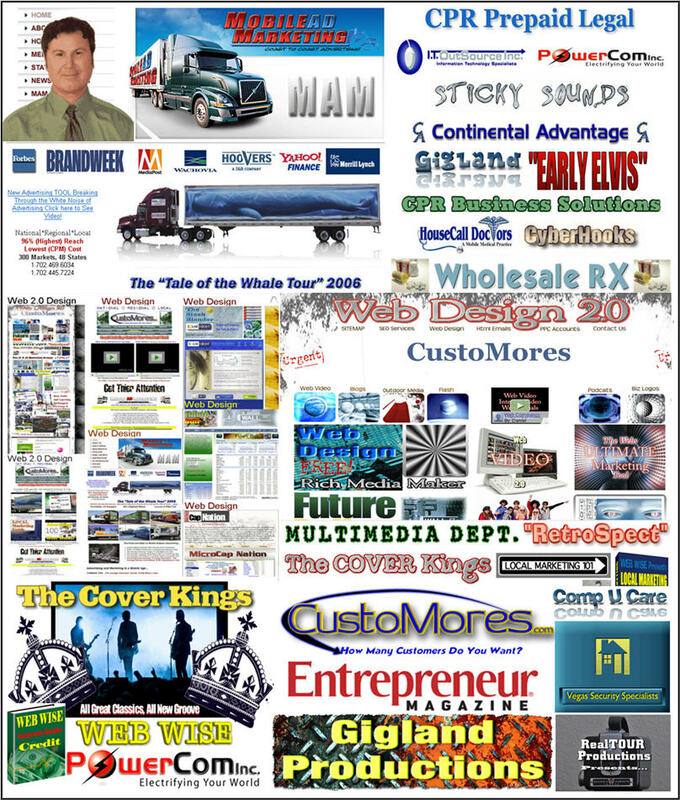 The Average Truckside AD Reach (DEC) is 50,000 per day. The Average CPM Rate for Truckside Ads is around $1.20! According to the ATA - The Average Delivery Truck Makes 16 Mil. Impressions a Year.